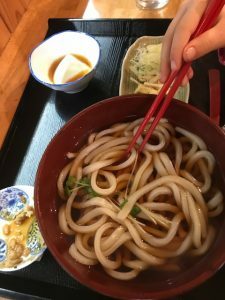 Located around the corner from Nerima’s wonderful Hikariigaoka Park sits the unassuming Sakura Udon Restaurant. It is not a place that any guide book would mention. It has zero social media presence with the exception of a crappyTrip Advisor review from 2013. I doubt that people from the neighborhood even consider it a restaurant. And I’m positive that most of its customers would be surprised that anyone would be interested in writing about it. 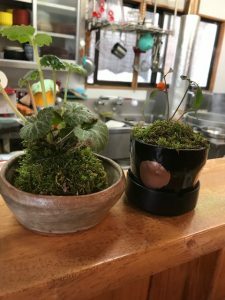 That said, I am completely smitten with Sakura and my “smitteness” has to do with how it encapsulates so many positive and unique aspects of the Japanese dining experience. Sakura is set a ways back from the street — it sits at an odd angle, as if it were dropped from a great height. Potted plants and mossy goldfish bowls dot the entrance. 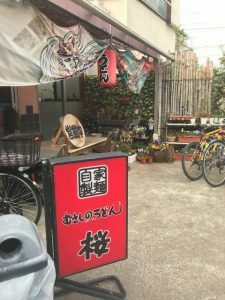 A weatherworn poster of a bowl of Udon hangs from the side. I have good food radar — I have honed it from years of experience and for the most part, my intuitions are correct (with the notable exception of the transient woman who used to sell some type of Latin American chicken to workers in Chinatown. Looked like a huge discovery. Tasted like school lunch.). I first spotted Sakura on a drive to a gigantic shopping plaza / residential development in Nerima. After a couple of hours shopping, I was starving. The development itself is massive — a giant, planned community with multiple high rises and a pedestrian promenade lined with chain restaurants and shopping — a scary vision of what a modern Tokyo could look like in coming decades. Despite my son wanting to go to KFC, I forced us all to backtrack to Sakura and, like that, we found one of our favorite spots in town. Sakura is nominally an Udon restaurant. The menu is composed of Udon sets — $6 gets you a bowl of hot or cold Udon with a variety of toppings (meat, daikon, etc. ), some pickles and nice hunk of freshly made tofu. The Udon itself is quite good — handmade, freshly cut and cooked to order by the chef/owner, a spritely woman in her 60s. She is one of the hardest working restauranteurs I have ever seen. Somehow she does everything — takes orders, cooks, buses the tables, washes the dishes — and I have never seen her sweat, never had food take too long to arrive, never had a messed up order and never had a moment when she was not completely gracious and solicitous of myself and my family. Her restaurant, while homey and comfortable, is fastidiously clean. Tokyo people guard their privacy jealously. The home is an inner sanctum rarely breached. Front doors are off-set, hidden by walls, shut off. There are no “WELCOME” mats. While it is changing with younger generations, entertaining at home is rare. Best friends often have never seen the insides of the other’s home. The privacy issue is one thing and lack of space is the other — by and large, when you want to entertain, you go out to eat and drink. 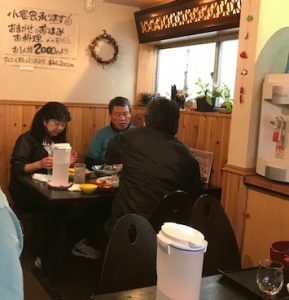 Each time I have been to Sakura, the back tables have been filled with groups of friends — members of a tennis club relaxing after playing a few sets, old high school friends, neighborhood shopkeepers. The restaurant was an extension of their living room. A bottle of shochu was cracked open, beers poured and dishes began to appear. Whatever the chef has on hand, she serves. It is home-style cooking, nothing fancy: Stir fries of eggplant. Whole fish. A spread of sashimi. Fried chicken. A platter of 12 gyoza held together with a crunchy latticework of rice flour. Ginger beef and baby bok choy. The owner told us that these groups will call her early in the day, tell her what time they are coming and she goes from there. What she cooks doesn’t exist on the menu. Occasionally, diners will request a dish, and if she can make it, she will. I doubt price is discussed beforehand, but I am sure whatever the bill comes to, is is beyond reasonable. I have not yet had the fortune to eat at Sakura with a large group. By shamelessly begging, I have been rewarded with a few off-the-menu dishes and if they are anything to go by, I await the day that I can get the full experience. Sakura’s kitchen is tiny, a huge, frothing cauldron for udon and 2 burners for frying and a wok. With seamless timing she juggles both stations, cooking for the groups and her regular Udon customers. She anticipates the needs of her customers, drinks are there when you want them, a dropped chopstick automatically replaced. It is better customer service than you would find in 90% of high-end New York restaurants. She is essentially a private chef, a caterer in her own restaurant. Or rather, she is more akin to a fantasy grandmother whose kitchen is always open and she is always happy to cook for you and your friends; and best of all, she is indulgent about your drinking and she does the dishes when you are all done!!! It is the type of personalized, warm dining experience that could never exist outside of Japan — and if it could, it would be beyond the economic range of most people. Here in Tokyo, however, it is completely taken for granted. No one would think to comment at how special it is or how lucky they are to have such a restaurant at their disposal. For me though, it is restaurants like Sakura that have most astonished and inspired me since I arrived in Tokyo. They reflect the genesis of the hospitality industry when someone or another was just a better cook and less cranky than anyone else in the village; their spouse always had that extra bottle of wine and people started hanging out in the kitchen, leaving a couple of dollars when they left. The rich had chefs — they weren’t going out into the common streets to get a bite to eat. Now, of course, restaurants are markers of status. Oligarchs will drop $50,000 on a bottle of wine and a few Waygyu steaks. In America, the ability to wander into a restaurant and be catered to in such a personalized way — to have your culinary whims indulged — is a treat reserved for the super privileged. The rest of us make do with hopefully a good restaurant or two that will remember our faces and perhaps hit us with an off-menu item on a special day. But here in Tokyo, Sakura, and restaurants like it, are part of their communities. They are a part of daily life and they return that privalege to the rest of us in the most democratic of ways. 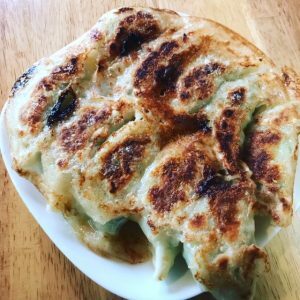 It may not be fine dining, but faced with a plate of that perfect gyoza, the laughter of your tennis pals and a frosty beer, where the hell else would anyone rather be? So look no further than Soith Orange, NJ, where the buy in price for these services is the most democratic of all— we KNOW you.